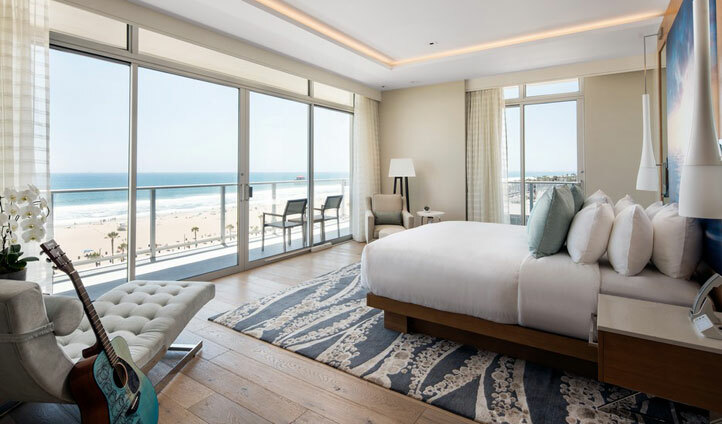 Paséa Hotel & Spa is just steps from the iconic Huntington Beach Pier- the making of Surf City USA. The pier, stretching 1,850 feet into the Pacific Ocean, originated at the same time as the city in 1904, and was made famous by legendary Hawaiian watermen Freeth and Kahanamoku. Stroll along it at sunset, enjoying the ocean panoramas, perhaps rent a rod-and-reel and try your hand at fishing…then wander back to the hotel for a luxury spa treatment – we love the Sea Stone Massage in keeping with the oceanic feel. The coastline also features more than 500 bonfire rings- we recommend stocking up on marshmallows and pretending you’re 15 again (a new Guiness World Record was actually set this year for the number of people making s’mores at one time). Essentially- you’re staying on one of the most iconic beaches in California. What more do you need? Ok, we’ve already mentioned the panoramic views from the hotel rooms, but we think they deserve a second mention. You’ve really got to see it to believe it, so we suggest you get in touch, and you’ll be basking on the balcony before you know it. As well as the huge windows, the rooms feature beautiful surf photographs spanning entire walls and really, really big bathrooms. 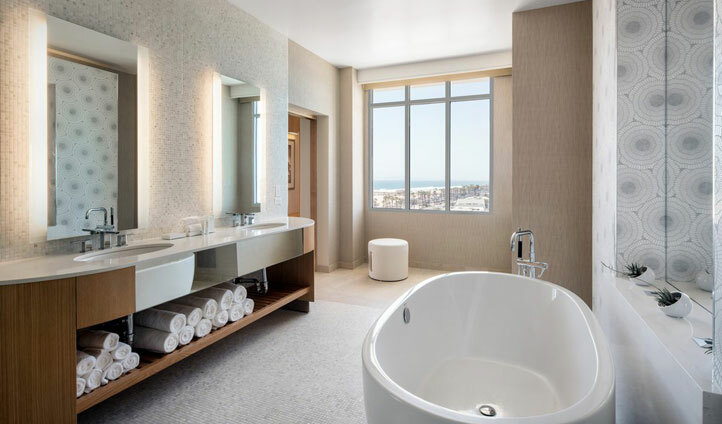 Lie in the bath, gaze out to sea, and wave goodbye to your worries – for good. Staying in a suite? Then take time to appreciate the stunning hand-painted guitar. You can even order one to be custom made through room-service should you fancy taking home the ultimate souvenir. We love that surf culture is ingrained in every aspect of the hotel – such as the World Surf League surf exhibit on display near the hotel’s signature restaurant Tanner’s. Even the in-room amenities of a GoPro and your own surfboard encourage you to take to the waves. We also love the fresh, Southern Californian cuisine at the restaurant, featuring naturally, sweeping ocean views and the rooftop bar where you can sip a cocktail and gaze out to sea.